Hold ‘em anyone? Your weekly game deserves to be lit up by our beautiful conversational Poker themed fixture. 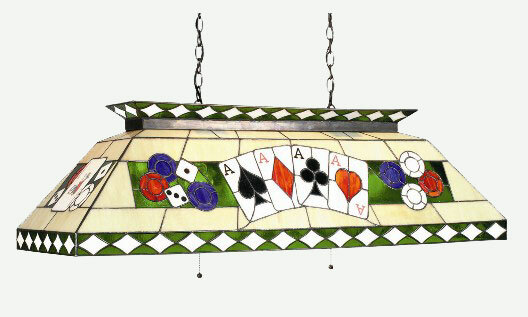 This true stained glass pool table light features hand constructed glass, brass channel and is hand soldered. Seams are hand wrapped in copper foil. You will not believe how beautiful this fixture looks when lit! Your guests will marvel at its beauty. Matches our stained glass poker table light.